Greg talks Wandersong development, cheesesteaks, and what's next. We recently got the opportunity to talk with Greg about Wandersong and what comes next for him – including drawdog. It was interesting to hear about what inspired the positive feeling of Wandersong , discover things like his introduction to video games as a kid, and what franchise he’d love to get his development hands on. For those who don’t know you, who are you and what is Wandersong? My name’s Greg Lobanov, I’m a game developer from America (now in Canada) and I make GameMaker video games. Wandersong is a musical adventure game where you play as a bard and you use singing to save the world, help people and solve their problems. You’re originally from Philadelphia, what’s the inside scoop on where I can get the best Cheesesteak? There’s the one street corner where there’s Pat’s and Geno’s and that’s like the big one. Those cheesesteaks are good but they’re not necessarily the best. The thing that makes Philly really special is that all the cheesesteaks there are pretty good. Like, your baseline’s really high so you don’t really have to go to one of the famous ones. You could go to some random corner and you’ll get something that you’re not really gonna get in other places. So I would say, don’t stress about it too much. Do you remember your first introduction to video games as a kid? Yes, I do, very specifically. At the time I was living with my mom – she’s from Russia. We were living in this small apartment and video games just weren’t a thing basically. But then one day, she was given (in the mail) a Game Boy, that she had ostensibly won from a magazine contest that she didn’t remember entering – because she subscribed to something. It was like one-in-a-million, they just sent her a Game Boy. She was almost gonna throw it out but then her boyfriend or someone was like “hey, you could just give it to your kid”. I was five at the time or something and she was like “oh yeah!” and then my life was ruined forever. What was on it, Tetris? Tetris was on there yeah, and Super Mario Land 2 or 3 – the one with Wario. I don’t remember what else. I don’t think I played the other ones as much. What games did you play after that? Did you stick with Nintendo or did you branch out onto other platforms? I would say I mostly grew up on Nintendo. Once I was old enough to really start making decisions for myself I got a PlayStation 2. That was my first non-Nintendo console. I played God of War a lot, and Shadow of the Colossus a lot, Katamari. So I branched out a lot but Nintendo is closest to my childhood heart, I guess. Like my youngest, little baby heart if that makes sense? Like this is artwork, these are things I’ve come to appreciate that I think about. But if I just see Mario, I’m just like a toddler again. If money or intellectual property issues weren’t a factor, what game franchise would you most love to put your own spin on? I definitely think about this for Pokémon a lot. I just love the world of Pokémon a ton so it would just be really fun to do something with it. The most recent games they came out with – Let’s Go, Pikachu and Eevee were really, really good though. I’ve been complaining about Pokémon for a while, just to my friends. The most recent ones made a bunch of changes that I didn’t think about at all, that totally fixed all the problems that I was having. So, now I’m kinda like “maybe I’m not really smart enough to do this”. I thought I knew all their problems and I could fix them but maybe they actually know better than me but I would like to try it, I think it would be fun. What changes specifically to Pokémon Let’s Go, Pikachu and Eevee did you enjoy? The new ones are very open feeling, which is kinda surprising because it’s still a linear story. Like, all wild Pokémon encounters you can see on the map and you choose which ones you fight at any given moment. You don’t fight wild Pokémon unless you want to and you also don’t have to fight trainers unless you want to – you can actually opt out of all trainer battles. Pokémon catching is actually meaningfully different from battling Pokémon. It just feels like whenever you’re playing it you get to make really meaningful choices about what you want to do. Other games you feel a little bit like you’re on rails. It’s just like “okay, the next thing that happens is this Pokémon jumps out at you” and in the most recent ones, you choose what happens at every moment. Whatever you’re doing, it feels like it’s what you wanted to do and that’s just sweet. So, even though it’s not like a super open game in terms of the big structure, in the little structure you’re making so many decisions that it feels like an open game. I like the fact that you can change the Pokémon’s name at any time and you can take Pokémon in and out of your party at any time – there’s no friction. The things about Pokémon that are most interesting, the choices that are fun, are what Pokémon do you use and how do you use them? That’s what matters and everything in that game is servicing those decisions, and everything else is just made irrelevant now. You caught something cool? Use it, right now! Give it a nickname, change its name! I don’t care! That part is really, really cool. Argh… It’s very good. What Pokémon is your favourite? Did you go Pikachu or Eevee? Oh, I would have picked Eevee but I was playing with my partner and she really, really, really likes Pikachu and she actually bought the game, so it was her pick. Before Wandersong you worked on a whole host of games including rougelikes and JRPGs. Is there a genre of game you haven’t yet touched that you’d like to? You know when I started making games, the first thing I tried to do was a fighting game. It was pretty hard as a first game to make and I’ve still been kind of intimidated to ever come back to it. I think fighting games are the games that I enjoy playing the most that I’ve put the least time into trying to make one. So maybe there’s something there, but at the same time, there’s so much that goes into making a good fighting game. What kind of style? Like Smash, Street Fighter or pixel art? Probably not pixel art, I dunno. Smash is my favourite one, that I play the most, but there’s already Rivals of Aether. I think Dan [Fornace] already has the like “indie Smash” thing on lockdown. I’m not gonna beat that out. But I’m thinking maybe even more like Nidhogg or something. I really like how that one works. Just try to find some new expression of that same idea because I don’t usually like to make just straight genre stuff. I like to do something weird with it. It could be rhythm fighting or whatever, I dunno. If I have an idea, maybe I’ll do it. In the new one, I have like ten right now, I haven’t narrowed it down too much. I think as of today – and this changed from like two days ago – but right now I really like Yoshi and Daisy. I just started learning them. I’d like to be good at Pichu, but I’m not. I play a lot of Lucas and Greninja, I don’t like Ganondorf any more, and Toon Link, and Pokémon Trainer who was my main until Yoshi or Daisy. I heard that Wandersong was inspired by a bike trip that you did, could you tell us a little about that? Yeah, I lived on my bicycle for five months and a rode from Philadelphia, down to Florida, across the south and through the desert in America, and then up California a little bit. It was like this ridiculous, adventure thing. There’s a lot to say there but the whole experience was very life changing. I came out of it with lots of new ideas and thoughts about, like, just the world and things. I wanted to make a game that was inspired by that trip and it took a long time to process but eventually Wandersong felt like it was the game that was about that. Is that because of the positivity and the travelling or was there a specific moment on the trip that inspired it? I think more just the general vibe but also a lot to do with just meeting strangers and being in new places and learning to trust random people. Wandersong has that big message about understanding one another and believing in each other, and friendship, and that kinda stuff. That’s something that I felt was a big part of that bike trip too. Where did the emphasis on music come from? It’s obviously a big part of the game and has this core wheel mechanic. How did that come about? It was after my bike trip and I think I was looking for an idea, and I didn’t know what the idea was. Independently, I had this idea for a music game and then I tried to make a control to a musical instrument. I implemented the little rainbow circle just on a blank screen, just the rainbow circle that you could play music out of. I was like “this is actually really fun to play with” and then I started having ideas about characters and worlds. It kind of felt like there was a connection between that and some of the stuff that I wanted to talk about from the bike trip. The music thing was just a fun thing to play with but then I had all these big themes and ideas that I was looking for a way to visit in a game, and it felt like this was a really good entry point for that. You mentioned that you had some stories from the bike ride that you wanted to tell, are there any specific moments in the game that are from your trip? Not directly but more that positive feeling, that world feeling, that connected feeling that I had that I wanted to fit into a game. The way that Wandersong feels, I don’t know any games that feel like that. Just that vibe of the game was what I wanted to do, that was what I was most excited about. The music thing felt like it had an attachment to that. There are some little hints. The most clear one is that there was this town I stayed in called Langtry in Texas, that I remember fondly. It was a really, really tiny town in the middle of a desert that had literally 13 people that lived in it. In Wandersong the first town you go to is called Langtree but it’s kinda the same idea, a really small town and that community feeling. Are all of the locations you go to in Wandersong inspired by real places? More or less. The second place you go to in Wandersong is called Delphi which is kinda named after Phila-delphi-a, but then past that it’s all very mish-mash. Nothing is supposedly one place, it’s just supposed to be like a region or a bunch of random ideas. I didn’t want anyone to play the game and be like “Oh, I’m in Russia now!”, “Here’s Japan!” or “Here’s Honduras”. I didn’t feel like I had the capacity to just go around the world and give you an honest picture of what these places were like. But I wanted to give you an idea of “I’m visiting different places that are exotic”. Do you have a favourite place in the game? I like everywhere in the game for different reasons. If you’re asking, where would I live, the one that I’m most excited about right now is Xiatian, the rainbow tree place with all the animals in it. That one seems very liveable, it’s very colourful, and it’s full of creatures and critters. So that feels pretty special and cool. I also really like the Witch City just for how weird it is. That was really fun to make up, so that one’s kinda fun for that reason. I like the coffee pirates, and as far as characters go, I think they’re maybe my sneaky favourite. But living on a boat doesn’t sound super fun in practice. It’s fun when you’re on an adventure for a day but then when you get to week two it’s like “alright, I’m ready for some land”. You mentioned the coffee pirates but is there a character in the game that represents you? Okay, so spoilers, but there’s a thing in the game that you can find (and that people have found) which is that I’m in the game somewhere but in a secret place. So technically that one, but I think every character definitely has aspects of myself in them. The Bard is probably the one that I would have to say has a lot of me in them, but I’m not The Bard. Visually Wandersong looks unique and unlike a lot of other indie titles. How did the game’s style develop? There were a lot of bad ideas before I landed on that one. As a personal goal, I’ve been trying not to do pixel art for my last however many years now. Just because it is the default thing to go to when you’re making an indie game and it’s relatively easy. I like doing pixel art, or I did, but I like taking a second or third idea just to find some way stand out. So I was looking for stuff that wasn’t pixel art and really what it came down to was that I wanted the shape of the world to be really jaggy, erratic, and paper-cut feeling. I wanted the game to feel really expressive and random, not tiled, not patterned. I made a level editor to make shapes that looked like what the game shapes would look like. Based on technical implementation, just how I made them work, I was like “this kind of feels like a look” and I was really inspired by Kirby’s Epic Yarn. That’s one of my favourite looking games, ever. I just tried to make something that feels really crafty. I guess it came down to the spirit of the game, the personality of the game. It wanted to be really erratic and colourful, and that just the kind of game it is. There’s loads of tiny little details in Wandersong, like the way different characters use different typefaces making you read them differently or the way the Bard’s clothing matches his environment. Is that something spent a lot of time on when you’re developing a game or something you notice when you play other games? It’s definitely something I notice when I play other games. The story of the game is what drives the experience of everything. All those little decisions, they came from a place of just trying to express the story of the game as clearly and honestly as possible. I’m actually not a very detailed oriented person, especially compared to other game creators that I know. For example, my closest friends made Celeste and that is a game that is so full of detail. Loving, and mostly needless detail that is there to look nice and Wandersong actually doesn’t have anything like that. Every detail that is there was usually because I wanted to express something about the character or the setting of the situation. Very pointed and targeted details. Wandersong was built in GameMaker, how was GameMaker and working with the Nintendo Switch? When we were doing it, it wasn’t publicly released yet and we were using a beta so there were a lot of very long nights and difficult issues. Wandersong, not just on Switch but even on PC or Mac – we definitely stretch that engine to limits that I don’t think it was meant to hit. There were a lot of very obscure, specific random bugs that we hit and still hit. For example, some people on Mac sometimes see some issues and it’s a GameMaker shader or something. Just very obscure, weird stuff that happens because I guess our game is just weird, you know? On the Switch, it was challenging that way. We had a lot of back and forth, a lot bug fixing stuff. It was very not fun and I’m actually still, I won’t say traumatised; that’s a strong word but starting new games now, I always think about how tough that was and I’m like “oh, I don’t want to go through that again!”. But that’s years away so worry about it when it happens. Once it worked, actually having the game on the Switch, that was amazing. The fact that I could make a game in GameMaker, hit a button, and it builds on the Switch; that’s amazing. That was so cool and that’s why I go through it. I love it so much, but yeah, it was hard. Was Wandersong the first console game you’d worked on? Yes, it was my first console game ever. So I was nervous about that too, on top of everything else. I hadn’t gone through certification before and just didn’t know a lot of stuff. I feel a little more practised at it now, but it was all pretty scary at the time. When creating Wandersong you ended up building and open-sourcing your own audio engine. What does the Wandersong Audio Engine provide developers? It’s not as crazy, maybe, as it sounds. It’s all inside GameMaker, so it only does things that GameMaker can do. It doesn’t do anything really fancy with audio, it doesn’t add any extra effects, really but it adds really good logic. It’s like a creative tool. So if you’re an audio designer, it’s real easy to just drop audio files into the project and then you can design logic with a visual editor for how audio plays. I would say “if a player hits this block, play this” and then this is where [Em Halberstadt] would go in and say “this is a sound, but it’s actually ten different sounds that play at random – but depending on how fast you’re moving, maybe it sounds more low or more high. Or maybe it plays a different musical note based on your velocity in gravity or if you’re holding a button down”, that kind of thing. Making the audio different depending on the situation. So would an example in Wandersong be the ability to sing quietly? The singing wheel is actually a weird example because the logic that I wrote and the logic that [Em] wrote is very intermingled. It’s hard to tell where one stops and one ends because that one’s a really specific implementation. Fun examples are just like footsteps. If you’re in a spirit world, your footsteps will play little sequences of notes and stuff. That’s something that [Em] would design whereas I would be like “play a footstep”, and she would be like “Well, a footstep is actually one in a series of notes that play this little musical sequence. Oh, and if you’re running on this kind of surface it plays these notes but if you’re running on this surface it plays these notes”, stuff like that. The game is not actually saying that much, but the audio is doing all this logic to make it sound really varied and different. Is there a memorable story you have from Wandersong’s development process? So many… Okay, okay, so the first thing I thought of is when we were doing the ending song. We did this thing where we got on Twitter and got in touch with Kickstarter backers and Gord [McGladdery], who did the music, wrote a really short demo of what the song was gonna sound like. It’s just a simple loop that builds, and builds, and builds. Then we got in touch with tons of people and we asked them to “listen to this and then record yourself singing along and just give us the recording”. We got like two or three hundred recordings or something. Just a huge number of people contributed and we put every single person into the game as this giant choir of people. That was really, really cool. That was all Gord’s idea. For me, I really appreciate that, almost as a fan. I just thought that was really cool, it sounds really great, and I had nothing to do with it. So I just love it unambiguously in the third person. For a game like [Wandersong], it felt like the perfect way to do that kind of thing and a perfect way to end this kind of game. So that felt really special, I liked that. Do you think there’s every any space for DLC for Wandersong or is this a wrapped up story and you’re ready for the next thing? I’m definitely ready for the next thing, personally. People have asked about DLC stuff but the way I feel about it is that the only way that DLC makes sense for the game is if there’s a good new story to tell. Like, there’s a way to expand upon the story. I wouldn’t just add a new dungeon or something. As far as the story goes, I feel it like it ends in a really nice place. I don’t really feel like I want to bother the characters any more or ask them anything else. I feel like they’re pretty set. If I had a really strong idea for DLC, and maybe it’ll happen down the road, maybe I’ll change my mind about it. But right now everything is good, where it should be. What’s next for Greg Lobanov? I’m actually working on, as of yesterday, three different games but some more obviously than others. We just announced my next, kinda Wandersong-ish follow-up [drawdog], which is going to be a game about a dog that paints. I’m also collaborating on a couple of other smaller things. But yeah, definitely more games! There was a good moment when I was finishing Wandersong where I was like “Man, you know, games are tough! Maybe I’ll do animation or something for a bit”, like, I’ll just change gears. Then I had all these ideas, and I was getting really bored, and excited about making new games, so I just started doing it again. So that’s where I’m at. It’s really hard for me to stop because I just like it a lot, I guess. You mentioned the next game is a sort of follow-up to Wandersong, does it take place in the same universe? That would be a fun twist, but no. This one is about animal characters so it feels pretty different right off the get-go. I call it a follow-up in the sense that it’s a spiritual successor. At least so far, it carries a lot of the same base ideas, where it’s a game about using creativity to do things but the structure and format of this game is really, really different. I don’t want to say too much as it’s still pretty early, but basically, I want to keep making games that feel like how Wandersong feels. I want to find fun, creative gameplay things like that. So this is along that line. Is your next game one that Switch fans should be keeping an eye on? We don’t know yet. I would be really excited for it to come to the Switch, but I would say I can’t say for sure yet. Is there anything I haven’t asked that you think our readers would love to know about? I think I’m good. I mean, if you like [the sound of] Wandersong, you should check it out; and the Wandersong soundtrack too. Thanks again to Greg Lobanov for taking the time to talk with us. 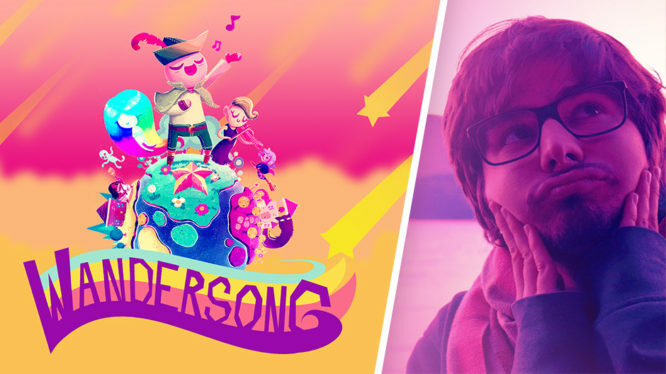 Be sure to check out Wandersong, read our review, and learn more about Greg and his work on his website.